What a fun day!! Today was our first day of VBS at BridgePoint Bible Church. Our theme this year is “Daniel’s Adventures in Babylon”. I am in charge of the Bible lesson, which is really a skit performed by “Daniel”and his chief advisor “Ashpinaz”. They are fabulous and have the ability to ‘make it work’ when the situation calls for it. My very good friend Tamara is the director of all of VBS and so I have had the privilege of seeing this whole thing come together from the very beginning of the planning process to the first day of execution. She has worked SO hard and there are so many moving pieces that she has had to place. Obviously she isn’t the only one working hard. Katy rocks the world of registration, Sue is the Pre-school princess, Kalsey is the most loving but firm disciplinarian (for those out of control moments) around. There are so many others. SO many. I am very fortunate to have friends like these. Honestly, whenever I feel extra-loved by my friends I think of my sister. She has friends in Ohio, but I don’t think she has a Tamara or a Katy or an Allyson or a Brandy. I could go on on. I am so blessed to be able to go on and on. 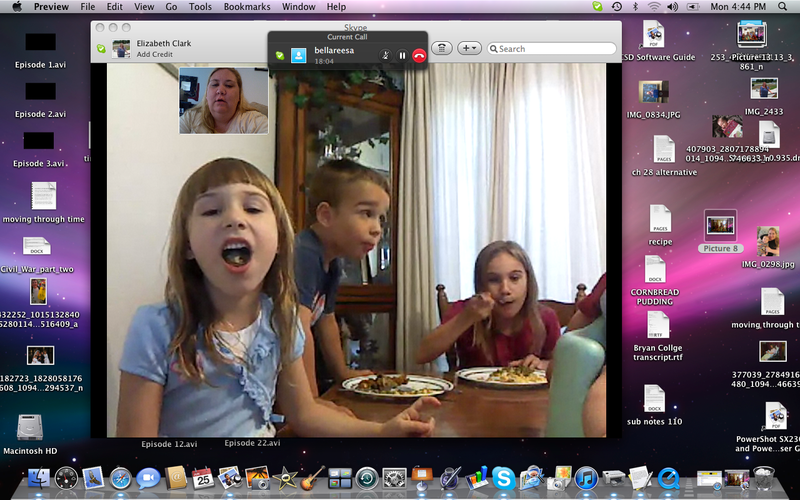 So this afternoon I called my sweet sister. 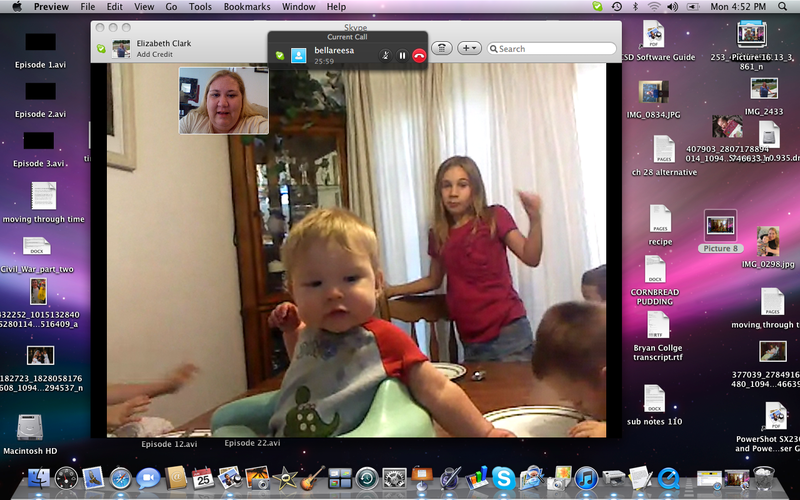 And we talked for a little, but then she had the BRILLIANT idea to Skype!! 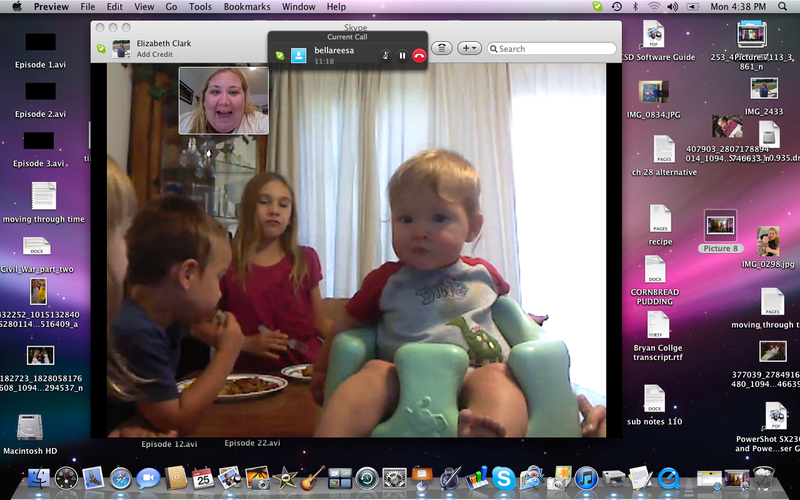 So they ate dinner (with Clark in his Bumbo in the middle of the table…) while we talked. I took about 23 screen shots. This was the last one and it is my favorite. 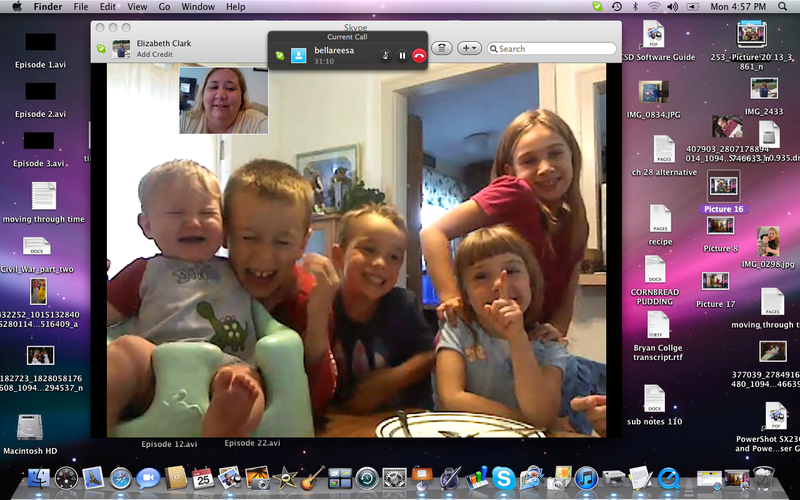 I think it just sums up this family and why I love these kids SOOOOOOOO much!! Here are some of the others….. I didn’t even have to tell her to do this. She just did it…. I love that about her. 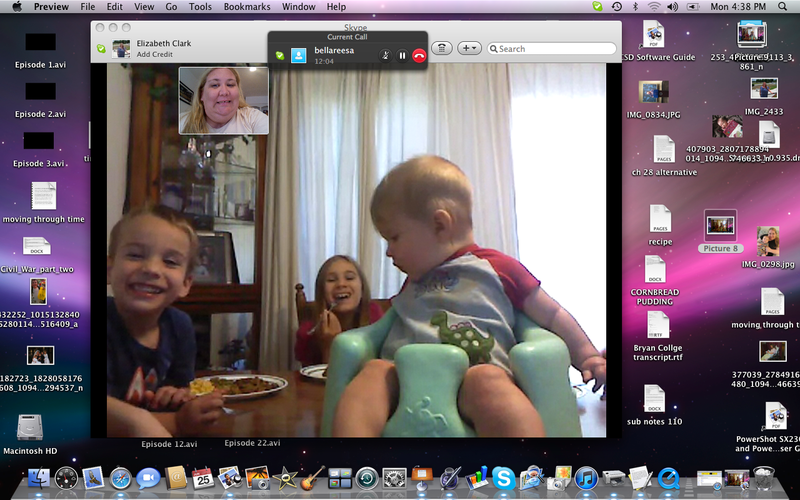 Then we talked about how that is actually bad manners…. because I don’t want her to be uncivilized! Abraham’s big smile. I will never get tired of the way he loves to talk to me!! Sweet 6 month old!!! Look at all that hair!